CfC Stanbic Financial Services has doubled its paid up capital to Sh250 million in a move that places it amongst the highest capitalized investment banks operating in the Kenyan capital market. Shareholders of CfC Stanbic Financial Services injected Sh125 million in paid capital in December ahead of the Capital Markets Authority (CMA) directive that came into force on 1st January 2011. CfC Stanbic Financial Services which holds an investment banking license, capitalized Sh60 million in retained earnings as tmajor shareholder CfC Stanbic Holdings Limited injected a paid up capital of Sh65 million. Nkoregamba Mwebesa CfC Stanbic Financial Services’ Managing Director says the drive to shore up the firm’s capital levels is part of a proactive strategy to consistently meet the needs of a dynamic market and offer investors a compelling shares trading proposition. “To restore market confidence, we must have strong institutions while as we market intermediaries play our part in reducing the systemic risk posed by weak institutions,” said Mr Mwebesa. Investment banks were required to raise their capital levels from Sh50 million on Sh250 million while brokerage firms were to increase their capital levels from Sh5 million to Sh50 million by the end of last year. The rapid growth at the Nairobi Stock Exchange has cast a spot light on the stability of capital market intermediaries with minimum capital requirements considered by many as a bold step towards restoring the integrity of the market operations. The increased activity in the primary and secondary market as well as growth in the number of market intermediaries has presented a litany of risks in the capital market key among them the stability of investment banks and brokerage firms. The capital requirements introduced by the CMA are a reflection of similar proposals mooted in the banking sector that seek to reduce the collapse of financial institutions due to inadequate capital levels. This is expected to foster confidence in the capital markets by achieving an environment in which market intermediaries can fulfill their financial obligations at minimal risk. The CMA sees the minimum capital requirements as a key development in reducing the probability of systemic risk. 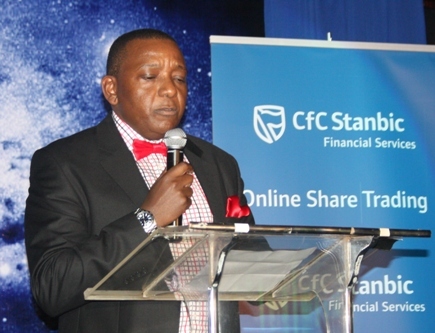 CfC Stanbic Financial Services recently launched the East and Central Africa region’s first online share trading platform that has revolutionized how investors buy and sell stocks listed at the Nairobi Stock Exchange. The platform is a global solution that can be accessed from anywhere in the world, even low bandwidth connections. Previous articleFacebook closure, what would it mean? Next articleBest 5 Apps to keep you running the Green Way!